The efficiency and effectiveness of Hydra will not be affected by the water temperature and the reaction time of Hydra cata-pure is almost instantaneous in nano second, therefore the flow rate that you had mentioned is ok for your setup. I did some reading up on internet and came across an article regarding this technology that your product is base on. It should also be aware that AOPs are not perfect and have several drawbacks. Most prominently, costs of AOPs are too high, since a continuous input of expensive chemical reagents are required to maintain the operation of most AOPs system. Some techniques require pre-treatment of wastewater to ensure reliable performance, which could be potentially costly and technically demanding. For instance, presence of bicarbonate ion (HCO3-) can appreciably reduce the concentration of ·OH due to scavenging processes that yield H2O and a much less reactive species, ·CO3-. As a result bicarbonate must be wiped out from the system or AOPs are compromised otherwise. I'd like to know would dosing of Sodium Bicarbonate reduce the effectiveness of your product (as mentioned above). Allow me to do a check and will get back to your enquiry soon. As our patented technology involves a catalytic media, sodium bicarbonate will not affect the efficiency. Thank you for highlighting this as this is the difference between our technology compare to the existing techonology in the market. The cartridges are rated for one year operation use. However, this figure/calculation.... is it not affected by the bioload of the tank that the setup is installed on? The Hydro Pure media life span is not affected by the bio load of the tank setup as it is not activated carbon which does. Hi QH, after installing hydra stream, I notice my orp readings been dropping..is there any correlations? Hi I am using hydra 50. When I was at Lfs, I realized that stream 3 is so much priced abv hydra 50. Hydra from the looks of the internal, is water passes thru the corse foam, then to the Cataylic media, between the 2 electrode plates, then out by pump. Care to show any cross section of it? How to change the media when due a yr? If I want to change to stream model for my 522, which stream model? 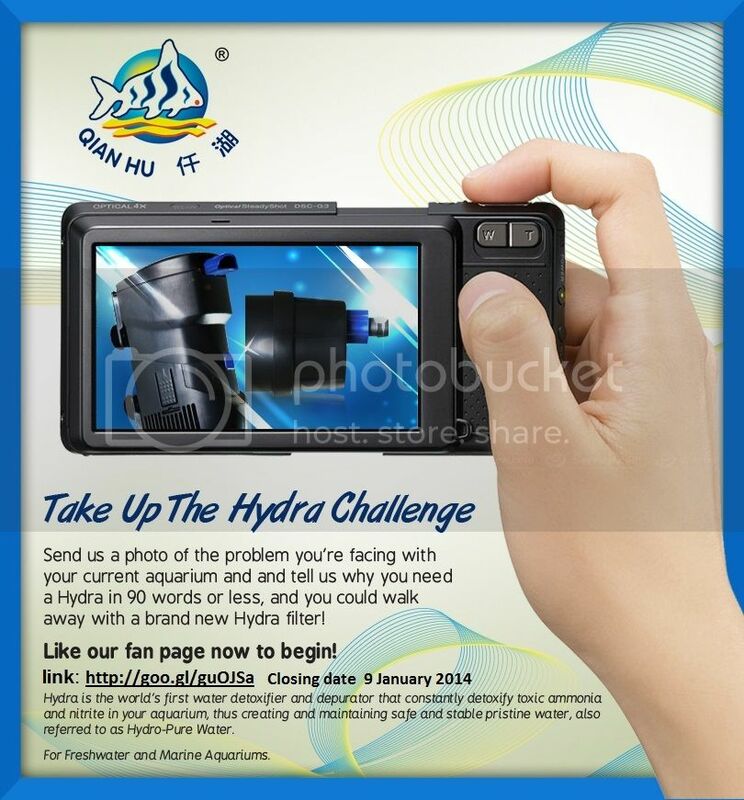 Currently we are having a hydra challenge contest on going at our facebook page .Participate Now and you could win one of 10 exclusive OF® Hydra aquarium depurators! Simply snap a photo and describe to us in not more than 90 words why you could use a new Hydra filter. ORP measures the Potential difference between the amount of Oxidizers and Reducers in the water. ORP readings depends on a few factors, such as the type of ions present, the pH, the amount of dissolved oxygen and organic loading in the tank. With consideration of the above factors, under normal circumstances, Hydra accelerates the breaking down the organic nutrients(reducers), so there will be more reducers being detected by the ORP probe, so ORP dropping reflects this action happening.